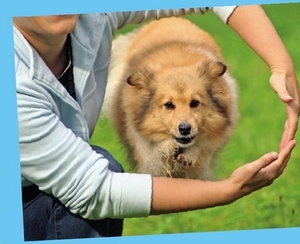 Once you and your animal friend have learned an impressive array of tricks, you may want to perform them for people other than your family and friends. Be sure to think this decision through and talk it over with your parents. You must consider many different things before taking your show on the road. Before you commit to a public performance, practice your tricks in a bunch of different places: different rooms of the house, out in the yard, at a friend’s or relative’s house, at the park. This will build your animal companion’s conﬁdence in new places. It’s not so easy for her to do the same tricks she learned at home when she is in a different environment. Be sure to give her plenty of practice. Before going anywhere with your pet, make sure that she is happy and healthy. A sick pet isn’t going to do tricks, and as a responsible guardian, you should keep her at home where she will be happiest. 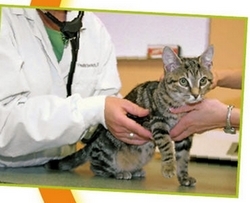 Have your pet checked by your veterinarian, especially for parasites or diseases that could spread to people. For dogs and cats, you may want to apply a ﬂea and tick preventive, depending on the area you’re going to. Be sure to ask your vet about this. If your pet has a health condition that requires medication or treatment at various times during the day, be sure to bring along anything you might need to give her. It may be better to keep her at home, though. She is just as good a trickster no matter where she performs. Always have a collar ID on your cat or dog, but especially when you leave your home. Ask your veterinarian about getting your pet a microchip. This tiny device goes under the skin and contains all the information needed to bring her back to you if she gets lost. usually a lot of fun and often give away great prizes. Keep a lookout for ﬂiers or posters announcing them. For shy pets who don’t like to go to new places, there are many online trick contests that use video recordings. Hospital patients and nursing home residents love to see the animals, especially if they know cool tricks. Once again, be sure that your dog is people-friendly and is okay around things like walkers, oxygen tanks, and wheelchairs. You’ll also need to get certiﬁed, which I will explain a little later in this chapter. Even if it isn't suppose to be hot out, being in an unfamiliar place can be stressful for your pet and she may get hot from working. Bring plenty of water from home, as well as a bowl or a dish that she can drink from. You will want treats while you warm your pet up and get her ready to perform. If she is nervous you may need treats to keep her focused and happy. These includes your clicker, touch stick and everything else you will need-- and possibly a few extra things. It is hard to show off the tissue trick if you don't have a box of tissues! depending on where you are performing,vaccination records may be required. No matter what it is always a good idea to bring one with you. You will need something to keep your pet safe if you have to do something without her. A crate or carrier provides a nice,quiet hiding place for your pet when she is not performing. Bring along paper towels, poop bags and a spray cleaner that takes care of pet odors. Animals in unfamiliar places may often have "accidents", even pets who are completely reliable at home. When you and your pet go somewhere new, remember that this is a fresh and exciting experience for her. Expect that you will need to help her out a little, especially the ﬁrst few times you go somewhere. She will need to get used to the hustle and bustle of being away from home. And if a trick goes horribly wrong, just laugh. No matter what, your pet will always be one of your best buddies. If you make a mistake, she’ll still talk to you when you go home. You owe her that, too. Forgive and forget, or save the story to tell over dinner someday and make everyone laugh. There’s always tomorrow.